Pardon Me, Does This Come in Purple? Nothing says, "Come on back to my shag-carpeted studio for bong rips and K-Tel 8-tracks!" like a hairy Jewish guy in a low-quality suit. 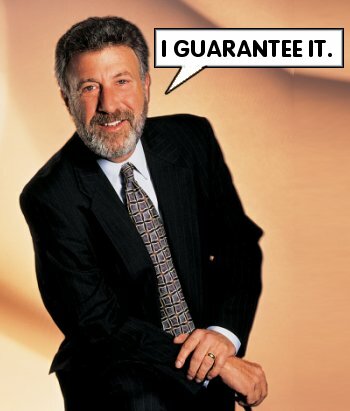 Given this understanding, I don't know why I was so surprised to hear that George Zimmer, founder of The Men's Wearhouse, donated $50,000 in support of Proposition 19, the California ballot measure to legalize marijuana. According to The Atlantic, Zimmer is largely responsible for funding the Yes On 19 campaign's first television advertisement. You can watch the ad, which features retired San Jose Police Chief Joseph McNamara, here. And to think, I always assumed that funny smell in The Men's Wearhouse was Ban-Lon. P.S. Don't forget to check the pockets of that rented tux before you return it. Tsada busts out "Ban-Lon". Full marks. Ban-Lon is underrepresented in today's textile community. This is great news! Prop 19: You're Gonna Like the Way You Smoke. Major props.